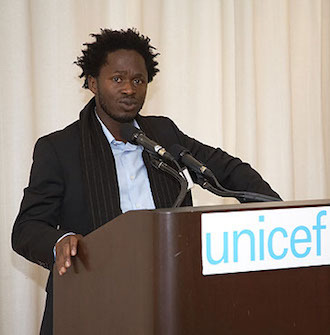 Ishmael Beah is a Sierra Leonean author and human rights activist who rose to fame with his personal history, A Long Way Gone: Memoirs of a Boy Solider. Beah was born on November 23, 1980, in Mattru Jong, Bonthe District, Sierra Leone, in West Africa. The Sierra Leone Civil War started in March 1991 when Beah was ten years old. When he was twelve, the war affected him directly. Rebel forces attacked his home village of Mogbwemo, killing his parents. Beah wandered as a refugee from place to place for nearly a year, both alone and with a small group of boys who included his older brother. Shortly after his brother was killed, Beah was recruited as a child soldier in the Sierra Leonean government army when he was just thirteen years old. Beah took part in numerous battles with the army, but in early 1996, at the age of fifteen, he was rescued from the military by the United Nations Children’s Fund (UNICEF) and placed in a rehabilitation home in Freetown, Sierra Leone’s capital city. He spent eight months in the home before being sent to live with his uncle. In November 1996, he traveled to New York City to take part in United Nation’s First International Children’s Parliament, a conference that addressed the devastating impact of war on children in various nations around the world. In 1997 with the help of UNICEF, Beah left Sierra Leone and arrived in New York City, New York, where he lived with Laura Simms, his foster mother. Beah, now seventeen, attended high school at the United Nations International School. After graduating, Beah enrolled Oberlin College in Oberlin, Ohio, graduating in 2004 with a Bachelor of Arts in Political Science. He also won Oberlin’s Dainne Vruels Fiction Prize for his Story at Noon. While at Oberlin, Beah was an advocate for the rights of children caught up in war. In 2006 he gave a speech at the Religious for Peace Youth Assembly, titled “Religious Youth for Peace: Confronting Violence and Advancing Shared Security” in Tokyo, Japan. In 2007 Beah published A Long Way Gone: Memoirs of A Boy Soldier, which told his story as a child soldier in the Sierra Leone Civil War. The book became a bestseller and was nominated for a Quill Award in the Best Debut Author category for 2007. Time magazine named it one of the Top Nonfiction Books of 2007. Controversy came as critics challenged the accuracy of some events, and the chronology has been called into question, particularly the claim that Beah became a child soldier in 1993 rather than 1995. Beah defended his account of the events, and in 2009, for the first time in twelve years, he returned to Sierra Leone, a homecoming which he described as bittersweet. In 2014 Beah published Radiance of Tomorrow: A Novel, his first attempt at fiction writing. Ishmael Beah, A Long Way Gone: Memoirs of a Boy Soldier (New York: Sarah Crichton Books, 2007); “Ishmael Beah,” Novel Guide, http://www.novelguide.com/a-long-way-gone/biography; “Ishmael Beah,” UNICEF, https://www.unicef.org/people/people_47890.html.